The Magical Cats Mysteries is a series of cozy/paranormal mystery novels by Canadian novelist Sofie Kelly (Darlene Ryan). Librarian Kathleen Paulson has moved from Boston to the fictional small town of Mayville Heights, Minnesota and soon becomes acquainted with two stray cats, Owen and Hercules, who possess special powers that aid her in solving murders. 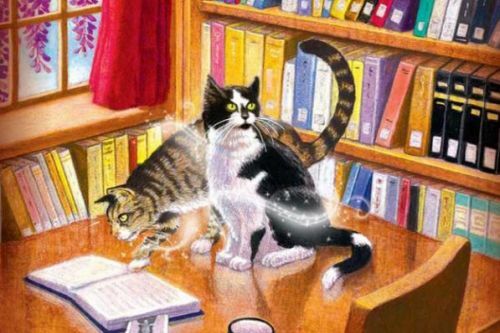 Magical Cats Mysteries Synopsis: In Sleight of Paw by Sofie Kelly (book 2 of the series), Kathleen Paulson didn’t picture herself as a cat lady, but now she’s convinced her cats, Owen and Hercules, have special abilities. When senior citizen Agatha Shepherd is found dead near Kathleen’s favourite hangout, she relies on Owen’s ability to become invisible and Hercules’ ability to walk through walls will assist her in figuring out this murder. Someone is hiding something and it will take some feline intuition to catch this killer.